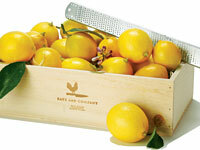 Meyer lemons are only in season during winter—and they’re definitely worth a taste. They have thinner, smoother skin and sweeter flesh than regular lemons, which makes them great in desserts and sauces. Buy a box at www.katzandco.com for $28.